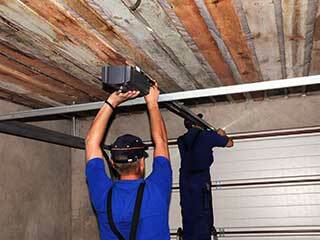 If your garage door is starting to behave strangely, or if one of its parts suddenly breaks, our experts can help you. Don't attempt to fix anything by yourself. These automatic door systems can be very dangerous to handle without the right tools and the necessary training. One of the most common issues your door could suffer from is a broken spring. Whether it’s a torsion or an extension type of spring is irrelevant, as these components are both incredibly dangerous to handle, and you should leave things up to us. We'll make sure to carefully remove the damaged component and install a new one in its place. Rest assured that your new spring will be able to handle the weight of your door effortlessly. The tracks are in charge of helping your overhead door move smoothly. If they become bent, or otherwise damaged, you won't be able to use your system properly. Our team can straighten them back to their proper condition, or replace them with new matching ones in case the damage is too severe. Your garage door opener is a motorized electrical device. That means it can experience a lot of different issues. If one of its gears breaks or wears out, it will make a strange noise, but your door won't open when you try to use it. We can replace the damaged gear and make sure your opener returns to its proper operation once again. Regardless of how big and complex a problem may seem, you can count on our experts at Garage Door Repair Staten Island to take care of it quickly and safely. Call us for any related need.